We are still reviewing and collecting information about any bugs and we want to help anyone with any launcher issues. Please send in a ticket and we will get it resolved. Its good of you to put on the face of trying to help but we just need you guys to stop making bugs. Installer does not run. An empty task square appears in my taskbar and then goes away. An Error Event entry is generated. ​​I was able to fix this by running the installer file in compatibility mode selecting Windows 7. Right click the installer -> Properties -> Compatibility tab -> Check "Run this Program in Compatibility Mode". Select Windows 7 in the drop down. When I try and import my games I get the following when I try to direct it to the game. I have Tanks, Warplanes, and Warships, and it doesn't matter which game I try to import. Also it seems that I can't connect to the server when I try to install said games. Edited by LibraMasemune08, Apr 27 2017 - 20:21. Redownloaded, and reran setup, unsbale to get launcher or setup to actually start. ​When I got that same error event, I was able to fix this by running the installer file in compatibility mode selecting Windows 7. Right click the installer -> Properties -> Compatibility tab -> Check "Run this Program in Compatibility Mode". Select Windows 7 in the drop down. 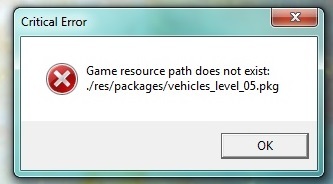 "Game resource path does not exist: ./res/packages/vehicles_level_05.pkg"
Edited by JoJoSnotts, May 20 2017 - 22:59. Warplanes will not work, seems to load up but the entire screen is black and/or with second monitor 'blinking'. Using DP for primary monitor LG Ultrawide 29UM60 and HDMI for secondary monitor VK246. Got WoT and WoWs to work after installing WGC, WoT and WoWs by running the integrity check on each. Ran intergrity check on WoWp but did not fix the black screen and screen flickering. Edited by JoJoSnotts, May 21 2017 - 16:14. Using an HP pavilion laptop. Play mod free. went into battle and discovered was not using the gun normally do with my t37. After the battle looked at the guns available for use with the t37. It showed that only had the stock gun unlocked. So opened up the tech tree for the tank and saw everything was stock for it and had to research everything again. Checked other tanks own and every single tank is now stock with all parts needing to be researched, again. Restarted the game to see if it was just some fluke and still having the same problem. worked damn hard to unlock and play the 154 tanks have in my garage to have to play them all stock. WHY CAN'T YOU JUST LEAVE THE GAME ALONE????? WHY DO WE ALWAYS NEED TO CONSTANTLY CHANGE IT AROUND, AND "UPDATE" IT? WHY THE HELL DO WE NEED A GAME CENTER, AND MORE RESOURCE HOGGING HIPSTER HACKS AND B U L L S H I T ??  Edited by ARS_41, Jul 07 2017 - 00:00. 1. Error message when clicking on the number of Premium Days you have left. When I click on the word Premium from my garage, I get an error that I am Unable to Extend Premium Account when 365 days are left until it expires. See attached screen shot. 2. Click on the word "Premium" from the Garage. The game is constantly hanging after the most recent update. Seems to play fine in game play, its when I get back to the garage. I'm using a Acer laptop, with windows 8 on it. I've had zero issues with play until this update. When it hangs, I'm unable to use any aspect of the computer until I log off from the cntl alt del menu. 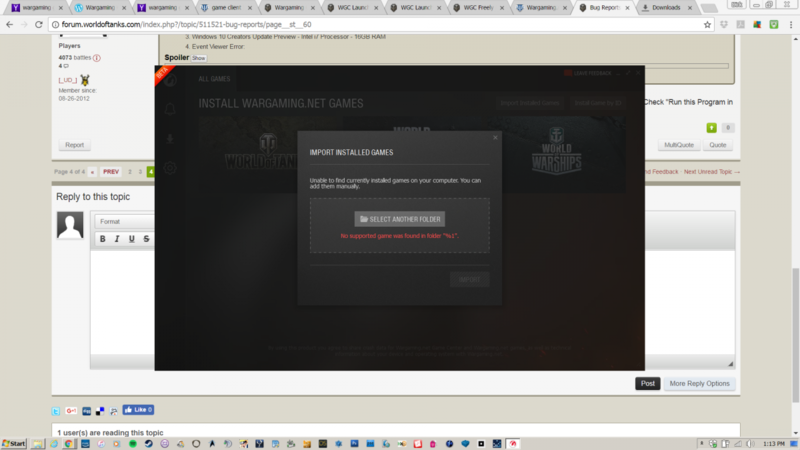 For the past little while when I have been playing WoT, the game has crashed randomly. I would then rejoin the game and as soon as i hit the login screen it would crash again. This would happen about three or four times in a row and then the game would work for a few hours. 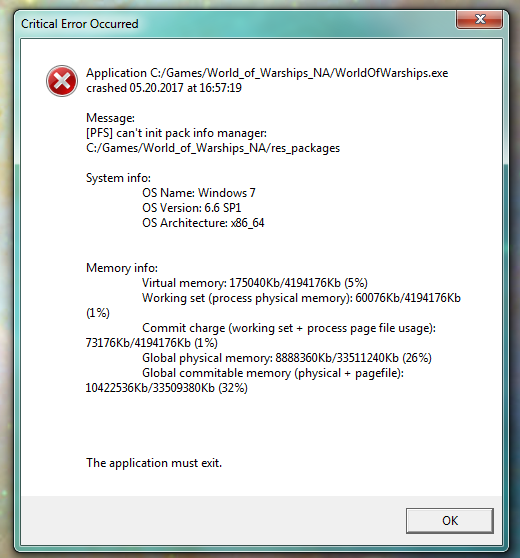 I have uninstalled the mod pack I had at the time and tried entering the game and again he game would crash three or four times and work for a few hours. Yesterday I decided to uninstall everything and reinstall the game and try it again. It has since crashed again. I have added a picture of the report that pops up. 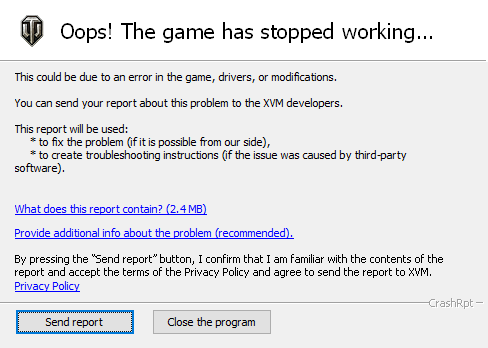 Please note that even though it says to send it to XVM developers, that the game sent me the same report when everything was uninstalled. Edited by Commander_Bam, Dec 16 2018 - 18:21.